It was just a little orange pill, a “capsule-shaped tablet,” glazed with a delicious coating of slippery sugar. If The Biped didn’t want me to eat it, why did he leave it on the bedside table? Did he really think I’d take the time to read the warning label? 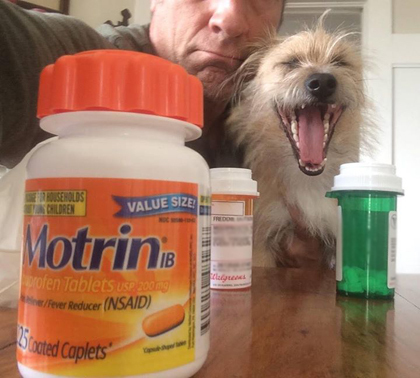 Did he really suppose I possessed even a rudimentary understanding of what “Ibuprofen” actually does, or any sense of the havoc 200mg of “fever-reducing Nsaids” can do to the plumbing of a thirteen-pound canine? Anyway, that was yesterday. Today, the Biped feeds you more pills and more peanut butter. Then he scoops up your crap in a plastic tube, and whisks you back to the The Marquis de Sade for more poking and prodding and various humiliations. Finally, just as you’re about to leave and apropos of nothing, Patchouli Girl sweeps in and trims your nails WAY TOO SHORT! Meanwhile, the thorn is still in there! Ugh. Honestly, it’s been a rough couple of days. “Pain Relievers?” I do not think those words mean what you think they mean…. PS. You’d think at these prices the thieves at the pharmacy could spell my name right on the damn prescription. Visigoths!